The hydrodynamic regime used in apparatuses with suspended transportable bed of granular material (ASTB) occupies an intermediate place between fluidization and pneumatic transport. To select the basic method of calculation of ASTB, it is essential to determine which apparatuses they are close to in flow structure. In this context, studies of the flow structure in the ASTB and determination of the basic design and technological parameters affecting this characteristic are urgent. 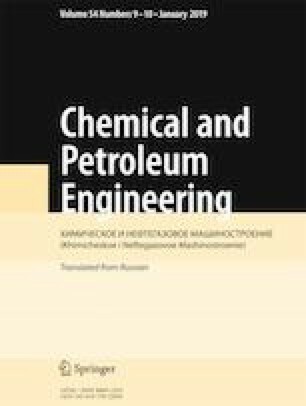 The results of determination of the modified Peclet number and the longitudinal mixing coefficient in a wide range of variation of ASTB operation conditions are presented. The obtained results confirm the closeness of the flow structure in ASTBs and pneumatic tubular driers. Translated from Khimicheskoe i Neftegazovoe Mashinostroenie, Vol. 54, No. 10, pp. 12–14, October, 2018.